Rarely does a completely new product enter the world of aromatherapy. Aromatherapy pioneer, Jeanne Rose, coined the term “hydrosols” in 1990 and wrote about hydrosols in her books, including the well-known 375 Essential Oils and Hydrosols in 1999. She is the one that first put hydrosols on the map in the US through her work with the Aromatic Plant Project. In, 2001, Suzanne Catty wrote the book Hydrosols: The Next Aromatherapy and 15 years later we are still learning how to use these floral waters in aromatherapy. So, when something new is released, people tend to get excited! Recently, Dr. Robert Pappas, chemist at Essential Oil University, discovered a new process to extract essential oil from the resin of Boswellia carterii (Frankincense) which yields a higher percentage of essential oil than traditional methods. A byproduct of this process is a Boswellic Acid powder which he has made available to a limited number of people in both a dry and wet form. This Boswellic Acid powder is an experimental substance and many things are still unknown about it. Shipments of the wet and dry powder were received by anyone that ordered it in the past couple of weeks and people are eager to give it a try. Certified Aromatherapist, Robin Kessler, created a Facebook group for people that bought the powder so that they can share their findings with other testers. In his original video description of the powder, Dr. Pappas indicated that a 10% dilution (or higher) of the powder in a lotion base was a standard guideline for usage. While this may or may not be a safe dilution, there are concerns that it could be too high. While this powder derived from Dr. Pappas’ process is new, Boswellic Acid powder is not. Cosmetic formulators use it for a variety of reasons and so there is data on that material. It looks as though many Boswellic Acid powders are derived from Boswellia serrata rather than Boswellia carterii so it is not a one to one comparison. Although Boswellic Acid content in Boswellic Acid derived from Boswellia serrata varies, standard is around 60-70%. Since no official analysis has been done on the Boswellia carterii Boswellic Acid powder, we do not know the exact percentage of Boswellic Acid. Both wet and dry powders have a very strong scent, meaning that there are at least trace amounts of aromatic compounds (essential oil) remaining in the material. It’s a good guess that the wet version has a higher amount of essential oil since the essential oil is what makes it wet. Dr. Pappas has said that he estimates that there may be about 10% Boswellic Acid in the powder, which would make it a far lower concentration than what is currently on the market (60-70%). Until we have actual reports, however, it may be best to err on the side of caution and assume it’s at the same level as other powders. I am excited about the potential applications for this Boswellia carterii Boswellic Acid powder and happy that I was one of the few to have received it for testing. Thank you, Dr. Pappas, for continuing to innovate and share with the aromatherapy world! If you are a tester and you don’t already have one, you’ll want to pick up a kitchen scale that is precise to at least 0.1 increments for grams. I’ll be ordering this one since mine only does whole grams. This calculator is for anyone that has been using Boswellic Acid powder in formulations and would like to be precise in how much to use when mixing. Use this calculator to figure out how many grams of Boswellic Acid to add to your carrier. 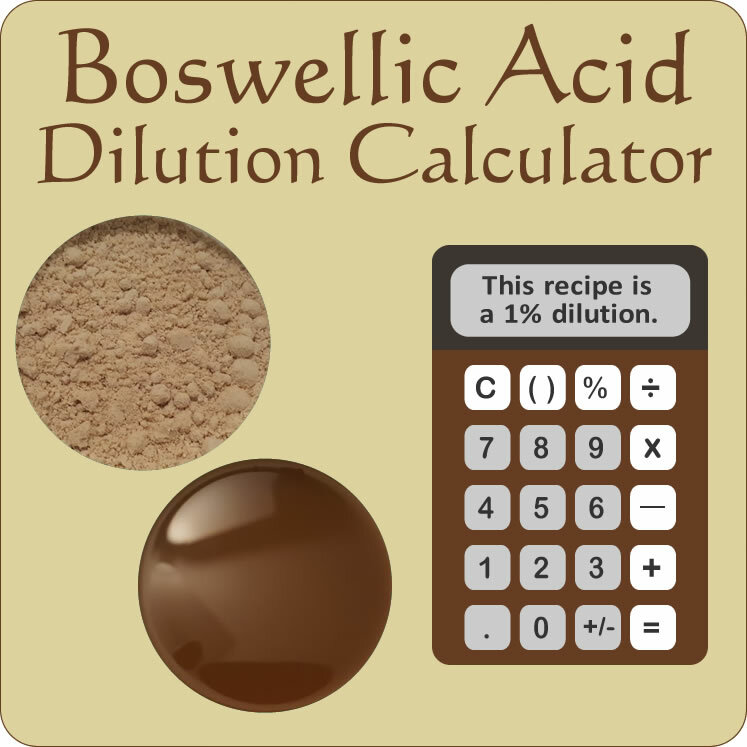 Use this calculator to figure out the dilution of a recipe you have for a blend with Boswellic Acid. Number must be between 1 and 100. Should not be over 2% for general use or 1% for facial applications. Add grams of Boswellic Acid to your carrier. Read more articles on Marvy Moms about essential oils. 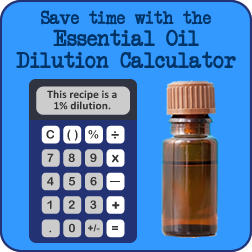 Use the Essential Oil Dilution Calculator to calculate dilution percentages for your essential oils blends! Get updates sent directly to your inbox so you never miss an article about aromatherapy on Marvy Moms.